SafePay is Federated Payments’ proprietary e-commerce solution allowing merchants to process credit card transactions safely via the internet. With a variety of options, you can tailor your SafePay account to your personal preference. 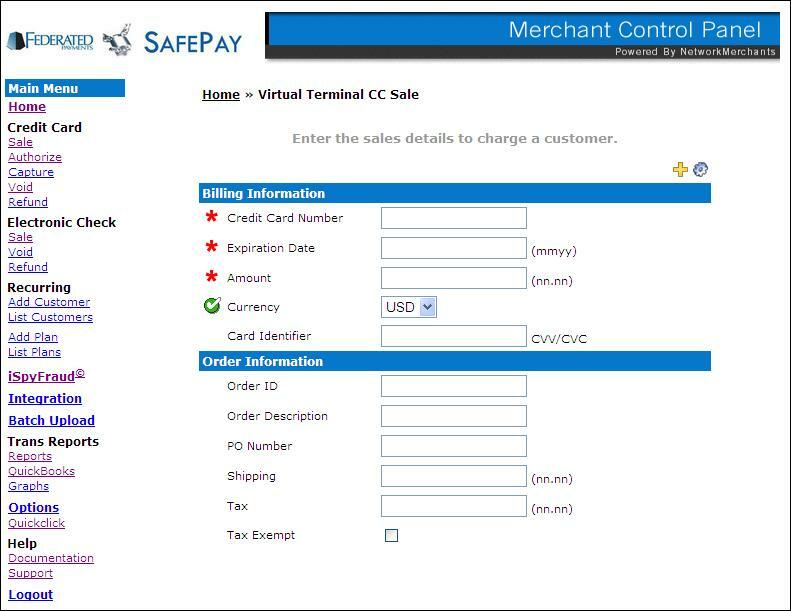 Through SafePay’s merchant control panel, one can access and charge customers’ credit cards conveniently and securely. Fully CISP and PCI certified – no need to worry about hackers trying to steal credit card numbers from your site!! iSpyFraud Protection – Receive additional value and protection using iSpyFraud. ISpyFraud provides custom strategies to identify the difference between legitimate shoppers and fraudulent shoplifters. It is the only solution that provides strategy management and customer service tools to help you save legitimate transactions that appear risky, as well as set policies for accepting and rejecting transactions. That means less risk to you and a better relationship with your customers. Virtual Terminal – With a Level 3 intuitive user interface, you will be able to authorize, process and manage credit card transactions manually from any computer that has an Internet connection and a Web Browser. API Integration – With the API Integration solution, you can utilize the highest level of secure transaction infrastructure available. Batch Upload Processing – With batch upload processing you, will be able to control and approve transactions manually prior to settlement. The batch processing system automatically allocates the batches in 1/16 bins and reduces overall processing time to a fraction of our competitors. Electronic Check – Electronic Check is a payment solution that enables online and traditional merchants to accept and process electronic check payments directly from their Web site’s storefront or through the Virtual Terminal. By accepting electronic checks, you are able to expand the payment options available to your customers and thereby increase sales.